Onboarding training is a great opportunity to introduce employees to your learning culture. In fact, if you're moving to virtual and blended learning, we believe it's the best place to start the transition. Regular blog contributor Brigg Patten explores other key elements to include in this type of training event. The onboarding process serves as a new employee's first impression of a company's culture, values, and structure. It sets the stage for the employee's ability to succeed and contribute to the organization's overall goals. Unfortunately, many companies do not invest properly in the onboarding process and this lack of attention can be costly. A recent study found that 31 percent of new employees leave a company after 6 months. This high, early turnover rate seems to be partly correlated with poorly executed training and onboarding programs. If you're looking to revamp your onboarding process, consider these key elements and send your new staff member up on the road to success. The first and most obvious step is to create a warm and inviting atmosphere in the office. Your new hire will most likely be nervous and anxious about the unexpected. Help ease some of their anxiety by having someone greet them at the door with a smile and a small gift. This first interaction sets the tone for the day and will help your new hire relax. You can also go the extra mile by decorating their new space with a welcome sign, a variety of treats and company swag. Based on another study, it seems that friendship is one of the most important components of happiness. Mentorship is a great way to foster this connection and make your new hire feel right at home. Assign your new hire a mentor for the week. This person will serve as the point of contact for any questions about policy, culture, or internal processes. This step will make your new hire feel comfortable and confident in asking questions and will help them bond with another staff member. One of the most overwhelming parts of the onboarding process can be the receipt and completion of all the new hire paperwork. This process can be daunting and unfamiliar to a new employee. Consider investing in an online portal that will allow your new hires to complete the paperwork in advance of the first day. You might also create a cheat sheet so employees can have a more clear idea of how to appropriately complete the forms. This step allows your new hire to do some thinking and evaluation in a low-pressure atmosphere and also gives you more opportunity to focus your content on things like company culture and processes. One of the best ways to engage your new hire is by creating a more interactive experience. Onboarding programs where a facilitator talks from a slide, or shares videos on a screen, are not the most effective means for learning and engagement. You'll want to create more interactive, hands-on scenarios so your new hire gets exposure to real, work-related situations and has the opportunity to interact with their co-workers. An eLearning company can offer many different types of employee training solutions to this problem. Do your research on the available eLearning solutions and consider investing in one of these modules. 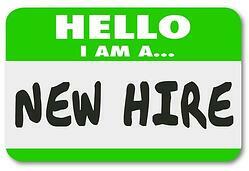 Your new hire will appreciate the opportunity to take an active role in their orientation. You'll also want to make sure your new hires understand where to find information after orientation is complete. The first day can be overwhelming and may feel like information overload, so you'll want to carefully create a resource center and design a handout with helpful office basics. The resource center can include items like a staffing list, security procedures, and an organizational chart. This will allow your new hire to reference everything that was covered from the day without feeling intimidated by asking a question. The only way to continuously improve your process is to collect feedback from your participants. Draft a survey and distribute it to all your new hires. Make sure you take the results seriously and look for patterns that will help you improve for the future. These are just a few of the many ways to improve your company's onboarding routine. These suggestions offer ways to make your onboarding participants feel more welcome and involved in the process. You'll find your employees are more prepared to contribute and are more likely to be committed to the company.